There is a way to minimize your hair loss. There are many causes of thinning hair and hair loss, some are caused by hormonal changes, diet, stress, anxiety and inherited traits. One thing is for sure it is a very upsetting and problematic issue for many people to go through. Loss of hair can occur from breakage or lack of hair growth. The average person should lose between 50-100 strands of hair a day. Because of aging and our genetics, our hair starts to thin as we get older. Thinning in our 30's can occur from menopause, pregnancy, and stress-related issues. Other factors like overuse of products like bleach, color, flat ironing, and blow drying can all add to breakage. Now we have a basic understanding of the causes of thinning and loss of hair let's look at some ways that we can prevent some of them. Massage Your Hair Nightly With Evening Primrose Oil. Just like getting your body massaged so does massage of your scalp increase blood flow to your hair follicles. Using oils like Coconut Oil, Avocado Oil, Primrose Oil, and Olive Oil can really benefit your hair. All of these oils can be used while massaging your scalp and strengthening your hair follicles. Why is Evening Primrose Oil Special? Strengthen you nails and hair with Evening Primrose Oil both topically and by supplements. Evening Primrose oil has high quantities of fatty acid called GLA and it that that contributes to the amazing healing properties of this oil. Not only is it beneficial to your hair and scalp but it is equally beneficial to your nails as well. GLA (Gamma Linolenic Acid) is found to be the reason for its property of preventing hair loss and even gaining hair. During the years of hormonal fluctuation like menopause and aging in men when dealing with an exaggerated conversion of testosterone to dihydrotestosterone at the hair follicle, Evening Primrose Oil acts as an inhibitor in this conversion. So it is a very good remedial remedy for hair loss problems. You can take Evening Primrose Oil by mouth 500 mg twice a day and you can apply it topically to your scalp as well. Follow these steps when applying Evening Primrose Oil to Your Scalp. 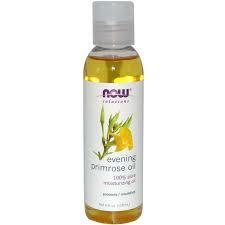 For Beautiful Shinning Hair Take Evening Primrose Oil. Helps with hair loss and thinning of hair. Taking Evening Primrose Oil is an easy effective way of dealing with hair loss and thinning. What have you got to lose give it a try? Evening Primrose Oil, it's What Mother Nature Intended for Your Hair. For more in depth information about evening primrose oil check out the article included below.